Beats by Dr. Dre urBeats review | What Hi-Fi? Like the headphone equivalent of a testosterone-fuelled teenager, it often appears as if Beats has only one thing on its mind. And what does that make us? Most probably playing the role of the dejected supply teacher, hoping that one day they will learn that there are more important things than bass. Of course, like an optimistic supply teacher who, despite having scissors thrown at them for the last four days, lives in hope that today will be different, we receive the Beats urBeats hoping sincerely this will be that day. 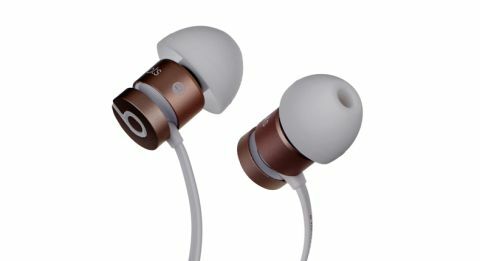 They certainly look and feel the part, though with Beats that has never really been a problem. The solid metal casing is great for those who don’t take the finest care of their possessions (a rubber pouch, resembling a kind of oversized ibuprofen, is included to help keep them safe), but Beats also claims it keeps out unwanted noise and vibrations. If our decidedly flashy rose pink test pair isn’t for you, there are five other combinations of black, red, gold, white and silver to suit your taste. There’s also an inline microphone for taking calls and controlling playback and the volume of your music, and a rubber-coated, tangle-free cable. Finding that all-important seal is dead simple for us: the buds already attached are already a perfect fit, but there are three alternative pairs, including a double-flange option, so you shouldn’t have any problem unless, perhaps, you are an elf or dog. In fact, they’re really comfortable in general; we wore them for a good number of hours while testing and were able almost, but for a bit of cable noise, to forget they were there at all. We begin by feeding the urBeats Deftones’ Around The Fur. It’s the kind of assertive, aggressive record we think they’ll really enjoy, and we’re proven right within the first three drumbeats of My Own Summer (Shove It). That offbeat tom and snare snap is vicious, followed by the terrifying weight of the first bass drum kick, which forces open the door for that grimiest of guitar riffs. Within only a few seconds, the urBeats’ bold presentation, so up-front it’s virtually offside, has foreshadowed brilliantly the malice of the three-and-a-half minutes to come. And it has more body than André the Giant; the bass guitar soon tracks that guitar riff and offers admirable solidity to Chino Moreno’s whisper-to-scream vocal. Fast forward a couple of tracks to Mascara, a track where Moreno’s voice is at its most fragile, and you can appreciate the warmth the urBeats allow it without losing all the delicacy. The problem is, these Beats fall short in just about every other category. Yes, that bass guitar digs deep, creating this dense undergrowth from which the rest of the frequency range can sprout, but it’s like the strings are made from marshmallow. It is a softness that loses much of the precision in the low end, mudding up the overall balance and appearing to slow the track down. To that end, detail in general is severely lacking; we change tack with Antony and the Johnsons’ I Am A Bird Now, and get little sense of the room. Live instruments sound unnatural and are void of any real texture; timing and dynamics are an issue here, too. Take a track such as Fistful of Love – not rhythmically complex, but instead offering a steady pulse – and it sounds more like a rehearsal than the emotional and oddly uplifting song it ought to be. Instruments don’t interact very well and there’s a shortage of growth or expression anywhere in those almost-six minutes. Offer them Charlie Parker and Dizzy Gillespie’s Bird and Diz, and the urBeats make it almost as difficult to piece together as it must be to play. These Beats don’t deserve an undue kicking, they just have the potential to do so much better if they could see the wood for the trees. The popularity of the brand is not due only to good marketing, there are millions of people for whom this forward, bass-driven sound is precisely what they want. However, in terms of our hi-fi equipment, we’d expect quite a lot more. So overall, the urBeats are a disappointment, but don’t expect this review to halt the colossus of the Beats machine.